Mouth of the Tyne Festival 2011 | Curly's Corner Shop, the blog! I’ve certainly enjoyed this year’s Mouth of the Tyne Festival from the Saturday night sea front parade through the myriad of entertainment along the promenade yesterday. Granted the crowds looked just slightly smaller on Saturday night but that was understandable considering the downpours which preceded the parade, but I think that overall numbers must have been up on last year when Sunday’s attractions were taken into consideration. I happily snapped away with my camera recording over 300 frames on the two days making it very difficult for me to decide which to share in here and at South Shields Daily Pictures over the coming weeks. The great thing about the Saturday Evening Parade, which takes place at around 9:30 pm as the sun goes down, is not just the spectacle of colours, noise, lights, and pyrotechnics, but the “inclusive” feel of the whole thing as people join in behind the street theatre and move en masse from Gypsies Green to the large car park on Littlehaven Beach to watch the climax. It always reminds me of the story of the Pied Piper of Hamelin. Many of those in the crowds were not Sanddancers but visitors from other parts of Tyneside and even farther afield, our summer events have become occasions when ex-pats return home to visit friends and family or when those from other parts of the UK decide to take “staycations” and make Tyneside one of their destinations. The only thing that irks me now about this festival is that Tynemouth gets all of the headline acts, I’m pretty sure that South Shields could handle at least one of these concerts utilising either the Bents Park, or Gypsies Green Stadium (well, it isn’t exactly being over used is it?). Perhaps our councillors and officers might like to start lobbying for a small change in format for next year? However back to this weekend and the picture above, for me at least, sums up one success story of recent years by allowing the operation of the caravan park at Bents Park to be privately operated. 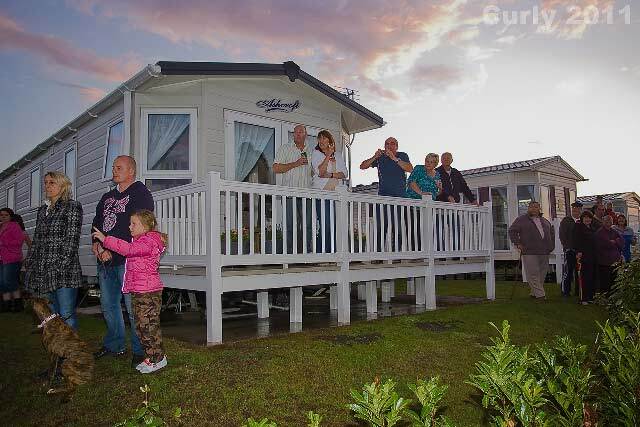 The recent investment in improved standards in the park is paying dividends and caravan owners visit South Shields or allow their units to be rented to visitors who come and spend here. We have to be open and say that we cannot guarantee good weather, but at least we can guarantee a good time in very decent conditions. In a couple of years time we will also be able to offer visitors a new swimming pool with a cafe and other indoor facilities right on the sea front as another reason to visit the town, and importantly a venue where they can take refuge from the rain! Which all brings to mind the one and only policy initiative ever offered to us by Ahmed Khan and the South Tyneside Independent Alliance, their town green plan of four years ago was inept, poorly considered, inappropriate, and likely to have blighted our regeneration and jobs prospects for generations! The picture above is one of the best reasons I’ve ever seen for rejecting such witless ideas.